On Thursday, August 31, 2017, I was bicycling up 8th Avenue in Manhattan. 8th Avenue has a protected bicycle lane, separated from traffic by a row of parked cars. Having been hit by a car door before and having woken up in the hospital, I appreciate having this protected lane. But after I passed 26th Street, I was forced to stop my bicycle, and walk it onto the sidewalk. The entirety of the protected bicycle lane was taken up by a semi truck. A McDonald's semi truck. And it was blocking a fire hydrant, while we're at it. Having a semi truck in a protected bicycle lane is a hazard to bicyclists, and of course, illegal, a violation of RCNY Title 34, § 4-08(e)(9). As I was about to leave, the driver entered the semi truck and proceeded to drive away, in the protected bicycle lane. This again is illegal, a violation of RCNY Title 34, § 4-12(p)(2), and I'm sure you can see how hazardous it is. So I tweeted about it, and tagged McDonald's. They asked me to call an 800 number. I did. I waited and pressed various numbers, and eventually got to talk to Luciano. He asked me what happened, and I described it. He said he'd bring it up with the "owners", and was about to hang up on me when I asked if he even cared enough to take down the license number and other identifying details. I gave him the details. And that's all. I witnessed a McDonald's semi truck wildly violating the law and putting the lives of bicyclists in danger, and I have an apology from a call center employee who is super sorry and assures me that he understands how upset I am. I am an old-school Quicken user, back to the Apple II days. Intuit used to be OK, but as the Mac declined in the 90s, Intuit started ignoring it. Every year they would throw a few more features into Quicken that no one cared about, and everyone would upgrade. Bank connectivity was simple; you downloaded files from your bank in the QIF format, and you reconciled things. But QIF wasn't a great file format. There was an open file standard called OFX that Microsoft Money used, but Intuit didn't see the appeal in that. Intuit took OFX, added a custom field to it called "INTU.BID", called the file format QFX, and started charging banks to get a number to put into that field. And because Quicken now worked online, Intuit could enforce the payment from banks. If banks didn't pay, Quicken wouldn't know about their "INTU.BID", and Quicken wouldn't download their customers' data. I don't know if that's legally extortion, but I'm going to call it that. And so do lots of other unhappy people. Meanwhile, Intuit continued to screw over Mac users. 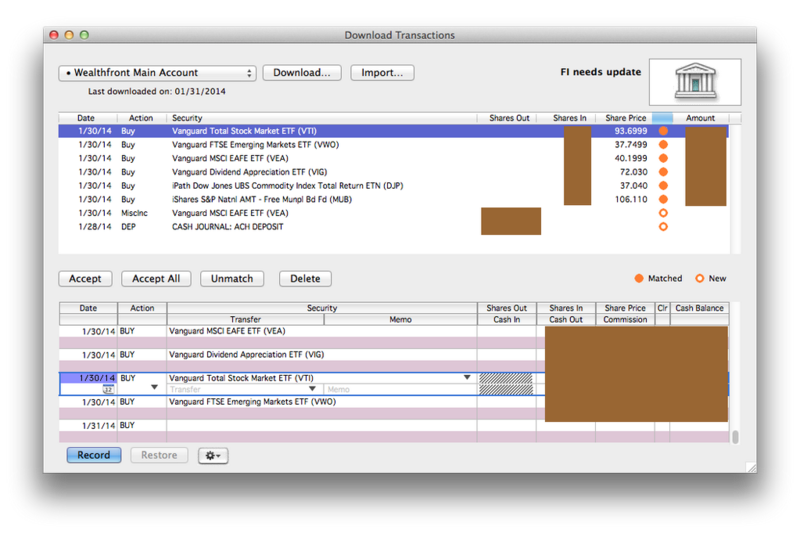 The last version of Quicken that Intuit released for the Mac was Quicken 2007. It was a PowerPC app. In 2009 they announced a new app, "Quicken Essentials for the Mac", which was released in February of 2010. It was an under-powered joke that didn't do things like track investments, so Intuit suggested that people who needed to do more than balance their checkbook keep using Quicken 2007. When Mac OS X Lion came out, and Quicken 2007 wouldn't run any more because it was a PowerPC app, Intuit acted swiftly. Lion came out in July of 2011, and seven months later in March of 2012 Intuit released a crappy recompilation into x86. Why do I bring this up? Because I hate Intuit. I despise them because they have made it abundantly clear that they despise me and all of their customers. But Wealthfront uses Apex Clearing to hold their accounts, and while Apex paid their Intuit tax and offers QFX downloads, guess what? They paid for Windows but not Mac. And so Mac Quicken won't import their files. Now, ever since Intuit pulled the INTU.BID stunt with QFX, people have been trying to work around it. If you google around, you'll find the usual suggestion is to switch out the INTU.BID number for one that works. I tried that, but couldn't get it to work. And then I asked myself, why don't I fix Quicken itself? Note that they ship their binary with symbols. Really. This made my job a million times easier. Look at the call to EBCache::GetWebConnectInfoForFeature. Quicken tests to make sure it has web connect info, and if it doesn't have that info it throws up the error dialog and dies. But what's interesting is that, at 212f73, it immediately overwrites eax. In other words, Quicken tests to make sure it has web connect info for the bank, and then immediately throws out that information. So what happens if I NOP-out that entire error block, so that Quicken always proceeds? It works. Quicken puts "FI needs update" as the bank name, but it allows you to proceed with the import. There is a problem, though. I experimented a bit, and found that if you do a partial import, and then try to go back to the "Download Transactions..." window, Quicken will say that you need to update your bank list. And if you allow it to do so, it realizes the tricks you've pulled, and disables your account from ever importing again. Looking, it seems like needsToUpdateBankList is a bad function to ever be in. No. We should never want to update the bank list. I overwrote the first few bytes of the function with 33C0C3 which is xor eax, eax; ret. and right now that's all that matters.